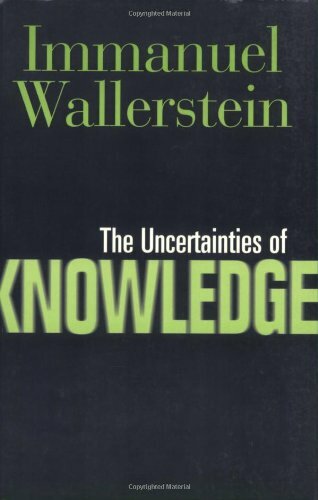 “The Uncertainties of Knowledge” extends Immanuel Wallerstein’s decade-long work of elucidating the crisis of knowledge in current intellectual thought. He argues that the disciplinary divisions of academia have trapped us in a paradigm that assumes knowledge is a certainty and that it can help us explain the social world. This is wrong, he suggests. Instead, Wallerstein offers a new conception of the social sciences, one whose methodology allows for uncertainties. Author note: Immanuel Wallerstein is Director of the Fernand Braudel Center, Binghamton University, and Senior Research Scholar at Yale University. "Immanuel Wallerstein is both a redoubtable world historian and visionary prophet. Such a combination is unusual...[and] makes him a commanding figure, whose rhetorical address, radical ideas, and remarkable erudition challenge ordinary, established patterns of professional discourse." "Wallerstein draws on his historical erudition and formidable theoretical powers to cast light on the ongoing transformation of our society. Even more impressive, he dares to think about the future." "Wallerstein is always readable, often persuasive, and occasionally profound."